Here is a summary of popular 5-a-side football rules that are commonly used in the UK. These may be modified for your own use, and also can be used for 6-a-side and 7-a-side formats of the game. Although these are popular rules that are played around the UK, there are variations between different competitions, particularly around the ‘head height’ rule, and use of the ‘areas’. To obtain a full summary of rules for your specific competition, start by contacting the organiser. 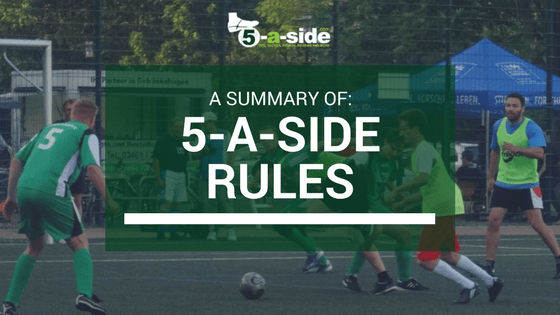 For more resources on 5-a-side rules, including a more comprehensive guide that will allow you to thoroughly tailor a set of rules for your own use, please see our main 5-a-side rules page. The following rules have been provided, under creative commons, by 5-a-side.com. These rules may be copied, edited and shared for your personal use, but please reference our website when doing so (and if you could provide a link, that would be lovely – thanks). Suitable footwear must be worn at all times. For artificial pitches, blades and long-studded boots are not appropriate. For indoor pitches on hard surfaces, appropriate indoor footwear must be worn and have non-marking soles. All players must wear a shirt at all times and teams must make every attempt to ensure that all outfield players play in similar colours. Players must wear bibs where available and instructed by the referee. For the safety of all players, all items of jewellery should be removed before entering the field of play, including watches. Additionally, it is required that all players wear shinguards. Where not addressed specifically in these rules, judgements over the suitability of player’s equipment are at the discretion of the referee. The referee will ask players to leave the field of play if they are judged not to be complying with these rules. The referee will determine who takes the initial kick-off, either by coin toss or by a pre-determined schedule. If halves are played, the other team will kick-off the second half. All players must be inside their own half for kick-off with the non-kicking players at least 2m from the ball. The ball must be played forward and may not be touched again by the taker until kicked by another player. Players may shoot, and score, directly from the kick-off. After a goal has been scored, play will be restarted by the opposing team taking a kick-off from the centre spot. The goalkeeper is the only player on the field permitted to handle the ball and may do so, only within the area. The goalkeeper is not permitted to leave the area and, if found doing so in order to gain an advantage, a penalty kick will be awarded to the opposition. Goalkeepers are not permitted to kick the ball, except when making a save. Any infringements of this condition will result in an indirect free-kick 2m outside of the area. When distributing the ball, it must be done with the hands, in an underarm bowling motion. Use of an incorrect action, or the ball going over head height even if a correct action is used, will result in an indirect free-kick being awarded to the opposition 2m outside of the area. A player who has received the ball from the goalkeeper cannot pass it straight back to that player. The ball must touch another player (which may be an opponent) before being passed back. Breach of this rule will result in an indirect free kick being awarded to the attacking team. In absence of there being a penalty spot, penalty kicks will be taken in the centre of the pitch, 1 yard back from the edge of the area. The penalty taker must be identified to the referee before the penalty is taken. The penalty taker is allowed one step before striking the ball. Outfield players are not allowed to enter either area. If an attacking player enters the opponent’s area, seeking to gain an advantage, the referee will stop the game and restart play with the goalkeeper. When shooting, the kick must start and finish outside area; if the player’s momentum then carries them forward into the area this will not be penalized unless the player is found to be interfering with the play from a position inside the area. If a defending player enters their own area, seeking to gain an advantage, a penalty-kick will be awarded to the opposition team. All substitutes must stand outside the field of play by the access gate, or behind their goals if there are no barriers. The ball may not go over head height. Head height is typically deemed to be the height of the tallest person on the field but shall be subject to the judgement of the referee in all cases. Where the ball goes over head height, an indirect free-kick will be awarded against the player who last made contact with the ball, from the position that they made contact. As an exception, play will continue if the ball goes over head height as a result of making contact with a goalpost or by a goalkeeper making a save. Headers are allowed, provided that they occur within the above rules. Players must not hold on to the barriers in order to gain advantage. Aggressive play against the barrier will not be permitted. Minimal contact should be used against other players against the barriers. Where a player retrieves a ball from the corner, they will be allowed to take the ball out unhindered by the opposition. Players have a maximum of 5 seconds to bring the ball out of the corner; violation of this time limit will result in a direct free kick being awarded to the opposition. Whilst within the perimeter of the court, the ball is not out of bounds. In the event that the ball leaves the perimeter (other than being kicked over head-height, where such restrictions apply), play shall be restarted with a kick awarded to the appropriate team. This kick is indirect and opponents must be at least 2m from the ball. Where a player is given a red card, they must leave the field immediately and may play no further part in the game. They may not be replaced by another player. In the event of persistent or extreme abuse or bad behaviour, the referee has the power to abandon the game which may result in the disqualification of one or both teams from the competition. Failure to retreat the required distance, or in the event of dissent, the kick may be moved forward by two yards. The ball may be moved forward as many times as is necessary where repeated failure to retreat or dissent is shown. If, in moving the kick forward, it would be within the area a penalty-kick may be awarded instead. Check out our main 5-a-side rules page, which includes free downloadable versions of the rules for your own use. If you want to consider some of the more controversial 5-a-side rules in more detail then see our guide to the worst 5-a-side rules.